When I first decided to be vegan I read something that say, “if you can be vegan expect for one thing then be vegan except for that one thing.” My one thing? PIZZA! I LOVE pizza and everything about it. Even bad pizza, I like. So I used to have a slice every month. Then every other. Now my desire is less and less. I’ve learned too much about what that cheese really is and what goes into it AND dairy make me feel super bloated and icky now. But I still LOVE pizza……dilemma….but not last night. My husband and I went to Kinchley’s Tavern in Ramsey, NJ. You don’t get more old school than here. Cash only, super thin crust pizzas, bar- I love it here. I was hopeful but prepared walking in- hopeful they would accommodate but prepared to have a salad. Well- their garlic bread is made with oil, not butter- CHECK! And my husband and I built a yummy, cheeseless, pizza loaded with onions, peppers, tomatoes, and complete with spicy red sauce. YUMMY! So yummy we ate a piece before remembering to take a picture! Lol. So Kinchleys goes on our list. 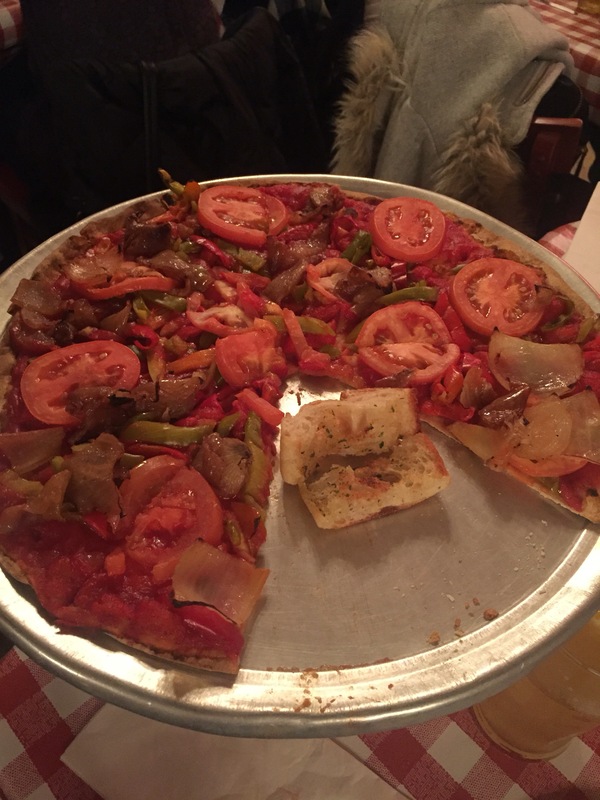 If you’re vegan, lactose intolerant, or know someone who is but still loves delicious pizza- this is your place! Next Post Every girl needs a good pair of flats!